384 pages | 100 B/W Illus. 3. Grassroots Gardening Movements: Towards Cooperative Forms of Green Urban Development? 12. Motivations behind Urban Gardening: "Here I Feel Alive"
Simon Bell is Professor of Landscape Architecture at the Estonian University of Life Sciences, Tartu, Estonia, and Director of the OPENspace Research Centre, Edinburgh School of Architecture and Landscape Architecture, University of Edinburgh, UK. 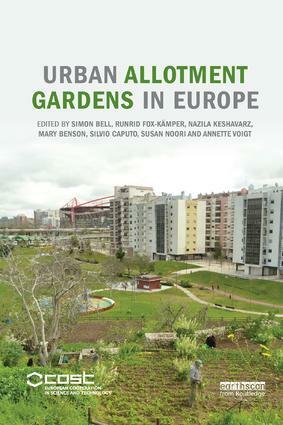 Runrid Fox-Kämper is an architect and Head of the research group 'Built Environment' at the ILS Research Institute for Regional and Urban Development, Aachen, Germany, and Chair of COST Action TU1201 Urban Allotment Gardens in European Cities. Nazila Keshavarz is a landscape architect and a research fellow at ILS Research Institute for Regional and Urban Development, Aachen, Germany. Mary Benson is a lecturer in the Department of Sociology at Maynooth University, National University of Ireland Maynooth, Co. Kildare, Ireland. Silvio Caputo is Senior Lecturer in the School of Architecture, University of Portsmouth, UK. Susan Noori is a social research consultant and an affiliated researcher with Birmingham School of Architecture, Birmingham City University, UK. Annette Voigt is Visiting Professor in the Department of Geography and Regional Studies at the University of Klagenfurt, Austria.